Actress Nichelle Nichols and Airborne Astronomy Ambassadors pose in front of the observatory telescope during their preflight safety training Sept 14. Front from left: Susan Oltman, Michael Shinabery, Jeffrey Killebrew, Nichelle Nichols, April Whitt and Jo Dodds. Back: Ivor Dawson. 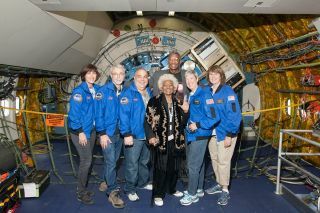 Uhura flies again: "Star Trek" actress Nichelle Nichols had the chance last month to ride aboard NASA's Stratospheric Observatory for Infrared Astronomy, a telescope-bearing Boeing 747 airplane. Nichols, best known for her role as Lt. Uhura on the original "Star Trek," joined scientists and educators on board the high-flying telescope, called SOFIA. A recent NASA video documented Nichols' SOFIA ride for Trek fans everywhere to enjoy. "We went where no man or woman has gone before, and I think that's what SOFIA gives us — a tool to study where we want to go in the future," she added. "It's magnificent." Nichols flew with five educators on Sept. 15 as part of NASA's Airborne Astronomy Ambassadors program, a professional-development program primarily for sixth- through 12th-grade teachers and science-center educators who fly along with scientists. On their return home, the educators share the scientific research and teamwork they experienced with students and the public at large, encouraging others to pursue science, technology, engineering and math careers. Most known for playing the first major African-American female role on television, Nichols has used her fame to advocate for science by recruiting women and underserved candidates for NASA and science careers. Despite being in her eighth decade, she continued this commitment with her flight on board SOFIA. The craft is fitted with a special door in the rear that opens to allow the telescope to peer outside while flying above the water vapor in the lower atmosphere that makes similar infrared observations impossible on the ground. That way, the scope can get ultraclear images without the monumental cost of launching a new orbiting telescope. It can also be serviced and upgraded far more easily than can a space-based instrument. With the NASA ambassadors on board, SOFIA studied multiple star-forming regions, as well as observing a protostar in the constellation Taurus to determine the way in which icy particles in space carry organic compounds to regions where stars and planets form. Nichols and the ambassadors answered questions through social media throughout their preflight training as well as once in the air for their 10-hour flight, which landed right back where it started. "Being on the flight with Nichelle Nichols was an incredible capstone to my participation in scientific discovery on SOFIA," Jeffrey Killebrew said in the same statement. Killebrew is an Airborne Astronomy Ambassador and a teacher at the New Mexico School for the Blind and Visually Impaired. "The process of research itself is amazing, but the social and educational ramifications that she represents are what sent the whole experience beyond the stratosphere," he said. "Being able to talk with my students and show them a video clip of Nichols talking about how Dr. Martin Luther King Jr. encouraged her to stay with the role of Lt. Uhura, and be that one person to positively illuminate African Americans during that tumultuous time of the late 1960s and early '70s, is very powerful for my students," Killebrew added.